eBay announced a new program that allows sellers to pay to get their listings extra exposure in search results, though when it launches in June, the Promoted Listings advertising program will be by invitation only. eBay sellers already pay insertion fees to get their items listed on the marketplace. The idea of having to pay advertising fees on top of regular listing fees to get exposure doesn't sit well with some. That said, many sellers participated in previous versions of eBay ad programs, showing some sellers are willing to pony up to get additional exposure to their listings. But why would a seller pay for ads on eBay when they could advertise their own website offerings through Google or Bing? 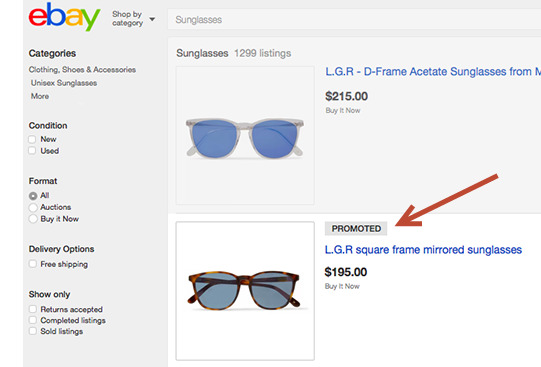 eBay's new Promoted Listings program is Cost Per Sale - sellers only pay for the ad if a buyer actually clicks through and makes a purchase. "In addition to looking at a seller's set ad rate, other factors are also considered, such as relevancy and how well an item is selling at the time the ad rate is set. Promoted listings from sellers with different ad rates may appear in different page locations." That means a seller who doesn't have as a good a record as others could get better placement as long as they were willing to pay. As we reported in the fall, eBay beta tested the program in October through December, and we noted that it's not the first ad program for sellers (remember eBay Keywords, for example?). There's now a lot more detail about the new Promoted Listings on the eBay website, and we'll have more on this in Wednesday's newsletter (now available here). Let us know what you think! As if final value fees and shipping fees aren't enough. I am working on my website currently. Years of bullcrap about the buyer experience, about cassini's careful balancing of factors in order to insure the best outcome for the buyer, now thrown away in favor of who pays the most for the post. Anyone still think the new bunch of spin doctoring bonus hogs will be any different then the last? Why do I suspect that invitations will highly favpr the Junk dumping , copyright and trademark infringing pampered platinums? I wonder at what point eBay is going to run out of ways to gouge sellers. You pay for a Promoted Listing because the listing you already paid for isn't being seen by anyone. You can't make this stuff up! I guess next we'll have a fee for every time someone views a listing, and another fee when someone puts the listing on a watch list. How could we possibly trust this group of psychotic liars and thieves to do anything they say they will? +Only a company as ethically challenged as eBay could come up with schemes like this. Step one: Engineer a search engine that favors certain classes of sellers and elevates them above all others. Step two: Design processes where by buyers are repeatedly encouraged to denigrate the seller they purchased from. Step three: Charge sellers to place listings on the site, then, hide the listings, implement rolling blackouts, and use their seller reputation, DSR's and other double secret ratings criteria to relegate their listings to the lowest ranking in search. Step four: Now that you have sellers desperate to achieve visibility for their listings, offer to elevate them in search for an additional fee. Step five: The more step four is utilized, other sellers with better reputations discover they have suddenly been demoted in search because eBay chooses to collect a fee to make so-so sellers listings appear higher in search than yours. Step six: After the higher rated sellers become desperate for visibility and sales, invite them to pay the extra fee to raise their visibility and afford them placement they had been receiving based on their performance ratings. Step seven: repeat as revenue requirements to please Wall Street increases. It would appear that the ethically challenged eBay has been studying the tactics of the mob and/or Triads. The Chinese junk sellers will be dancing in the streets. 1) eBay allows itself to steal from you as a seller by charging you for a listing, then never showing it. 3) if you are lucky enough to not have to compete with the ads on the side, there are more ads on the bottom of the page and those (most times) not only directly compete with you, but take you off to a NON eBay page. That brings us to 4) todays annoouncement that if you pay up abit aka the VIG, eBay will override the theft-tastic Cassini listing hiding machine and put your ad up close and on top so you can actually make a sale. ..... the sale you WOULD HAVE made had Cassini not hid you to begin with and eBay not already competed with you ... 2x. That scenario dear friends takes B@LLS. I hope Vinnie the Chin and his cohorts are taking lessons. Going to some guys bakery, eating all the food, forcing them to bake cakes for their kids weddings, then burning it down for the insurance is SO 1950s. Just start an ecommerce site, charge for listings and then dont show them. Then if you DO decide to show them or are forced to (taking money from people for a service and then not providing that service is a crime (fraud)) you put other peoples ads in the listings (making more money from the same space), AND you then sell the same space back to the original listing purchaser while doing nothing ... dude its a great gig. Money for nothing and your eBay for free ..... oops NOT for free. Seriously .. how is all this legal ? Wow!..First they tell you they can hide your listings and do.Then they want to charge you to make your listings visible.So what is the point of having insertion fees? How much more greasy and sleazy can this company become? I know you are not serious...er, sorta not...but Ina will be posting about those new fee idea's next month after Wenig adopts them. Would we be shocked? Really. They are going to make an offer I can't refuse? Pfffttt. If the same brain trusts that came up with Cassini or the defect system have anything to do with this Promoted Listings, it would be as useless as teats on a boar. It sounds too vague and half-baked to take serious at this point. If a legit group came up with this, I'd be a bit skeptical, since it is eBay...better read the fine print before you accept the invite. Just another listing enhancement I don't need. My items sell, I don't need more exposure. What I need is for eBay to stop discriminating against my overweight tools. Is there any way anyone can deny that the ebay management culture is one of schizophrenic lunacy ? Company A provides exemplary service with the highest quality merchandise. Company B has a terrible service record and sells questionable knock off merchandise. Providing the “invitation” to company A is essentially asking them to pay extra for something they are (according to ebay) entitled to already , namely primary positioning in the search engine. Providing the “invitation” to company B is punishing the buyer base by pushing them towards an inferior merchant simply because that merchant has paid for placement. Not to mention cheating Company A out of what they have earned and they deserve. Well, thats going to be about it for me folks. This PHHUCKING place can go to hell. From the limited details, it looks like one of eBay's top rated rip-offs, sellers will be bidding with a percentage of the sale price, up to 20% right now, but wait until it gets crowded, they will continue to raise the percentage, kind of like pay per click, but extremely profitable for ebay. These crooks will get what they deserve in the end. So glad we moved our inventory to Amazon where it is FREE to LIST ALL THE TIME! What a difference amazon has been, sales up 50%, website that works all the time, fair policies. Bye Bye ebay, will never be back. Just another ebay power seller who has jumped ship. and by eBay's agreement "your items may not show at all" what makes this offer any different? it still will be rolling blackouts. I guess that Google fined them so now your listings do not show anyway, what makes a seller think things will be different? and mostly does anyone really trust anything ebay says????? Have lost interest in SELLING on EBay totally now. Will just do one more weeks relisting then quit. Just buying now occasionally from all those BUY IT NOW listigs of corporations. Keeps the car running. Bye, EBay! How come when I am dealing with eBay I feel that I am dealing with bad carnival folks? You know, the kind that eventually get run out of town. Oh the schemes. Oh the deception. Ric, your term "ethically challenged" is much too kind. What a devious bunch. As we can already see, Wenig will be no different than JD.